It's been a beautiful weekend here - all weekends should be four-day weekends! We've enjoyed two fabulous Easter dinners with extended family, have satisfied (more than satisfied) our chocolate cravings, enjoyed the beautiful weather outside, and got in a little crafting, too. I thought I'd try to squeeze in this post while we're waiting for the glue to dry on our craft. Are you thinking about Earth Day activities already? I am. Two of my favourite books to use for Earth Day are Just a Dream by Chris Van Allsburg, and Human Footprint by National Geographic Kids. National Geographic also has a free PDF resource about the Human Footprint (good for middle school and older). Click here to see it. So, all the thinking about Earth Day activities, and being outside enjoying the beautiful weather this weekend, made me want to make an Earth Day freebie to share with all of you. 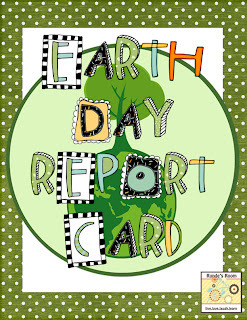 In this Earth Day Report Card, students are given three versions of Earth Day report cards: one for the whole school, one for the classroom, and one for the home. Students can work in small groups or individually to complete the report cards. There is also an activity page for students to illustrate and create a plan to improve one of the categories that didn't score well on the report card. Students can use these report cards to collect and analyse data for a graphing activity. They can use the results for persuasive writing to write a letter to the principal, or create announcements to be read aloud to the school. Completed activity sheets could be posted on a bulletin board in a high-traffic area of the school. I've uploaded this product to my TPT store and TN store. Just click on the picture above to download your own copy. Very cool idea! I will be using this in my classroom! Thank-you so much. I did something similar to this last year with my class, so I thought I'd "bump it up a notch" this year. I LOVE this . . . that carbon footprint thing makes a compelling argument, doesn't it? Thanks, Barbara! Really makes you think, doesn't it? Tag, you're it! Come over to my blog to get the details! This is awesome Jen! Thanks for sharing! You've been Pinned! Thanks, Mor! I think I was emailing you when you commented here. Great minds think alike! Hehe :) I will use it this Friday! That's a very cool idea! Thank-you so much, Michelle! Welcome! BTW - I LOVE your blog! Thanks Jen. I'm your newest follower and I will be teaching 6-8th grade Science next year. Nice to meet you! Thank-you so much, Pamela! I hope you find some ideas to bank for next year!!! This is great! We gave our classroom their report card yesterday. Thanks for sharing! Fabulous! I'd love to hear how your students responded to them - I hope they enjoyed them! Thanks, Janaye! I do hope they LOVE it! Are Your Conversations ... Grand?